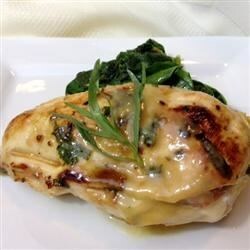 "Rollups of chicken breast, Swiss cheese and ham are baked and topped with a white wine/honey/mustard sauce. This is one of my favorites. It was trial and error. Play with the ingredient amounts, because I never use a recipe and these are approximations!" To Marinate: Mix 2 cups wine, tarragon, parsley and oil in a nonporous glass dish or bowl and. Add chicken, and toss to coat. Cover dish or bowl, and refrigerate to marinate for at least 4 hours. Remove chicken from marinade, and pour marinade into a large skillet over medium high heat. Cut chicken breasts in half vertically and quickly flatten each piece to 1/2 inch thickness with a meat mallet. Layer each piece a slice of cheese, slice of ham, and a sprinkle of brown sugar. Roll and secure with toothpicks, then brown in skillet with marinade. Place browned rollups in a 9x13 inch baking dish and pour a small amount of marinade over chicken, reserving at least 3 tablespoons in the skillet. Sprinkle chicken with salt and pepper to taste and a small amount of brown sugar. Bake chicken rollups in preheated oven for about 30 minutes, or until cooked through and chicken juices run clear. To Make Sauce: Meanwhile, add flour to skillet with reserved marinade. Add 2 cups wine, stirring constantly, letting sauce thicken. Then stir in mustard, honey, a bit of brown sugar and horseradish. Season with salt and pepper to taste, heat through and serve with chicken rollups. This was great. I left out the sauce & sugar because I am on a low carb diet. This did not change the great taste of the chicken. I loved this recipe! Yummm..